Onshore wind accounted for 9.1% and offshore wind 8% of total production in 2018 — both new records, according to the UK’s department for energy and industrial strategy (BEIS). In 2017, wind provided 14.8% of the UK's electricity — with 8.6% from onshore, 6.2% from offshore. Last year, 700MW of onshore wind capacity was added to the grid, bringing the cumulative total to 13.5GW, and 1.2GW of offshore wind was brought online, raising the total to 8.2GW. The UK’s total electricity generation for the year fell by 1.4% to 334TWh, with falls in coal, gas and nuclear output offset by increases in renewables, primarily bioenergy, wind and solar PV. Of this total, renewables accounted for 33.3% (111.1TWh), up from 29.3% in 2017, due to increased wind and solar PV capacity, BEIS stated. This includes several large offshore wind sites that were brought online or expanded in 2018, including the 659MW Walney Extension off the west coast of England — the world’s largest operational offshore project. "These record breaking figures demonstrate the unstoppable momentum for renewables, with spectacular global cost reductions in onshore and offshore wind," said Emma Pinchbeck, deputy chief executive of industry lobbying group RenewableUK. "We need Government to fully recognise that renewables are the future in our energy policy — from fair markets for flexible power and innovation funding for new technologies, to removing the obstacles in the way of our cheapest form of generation: onshore wind," Pinchbeck added. 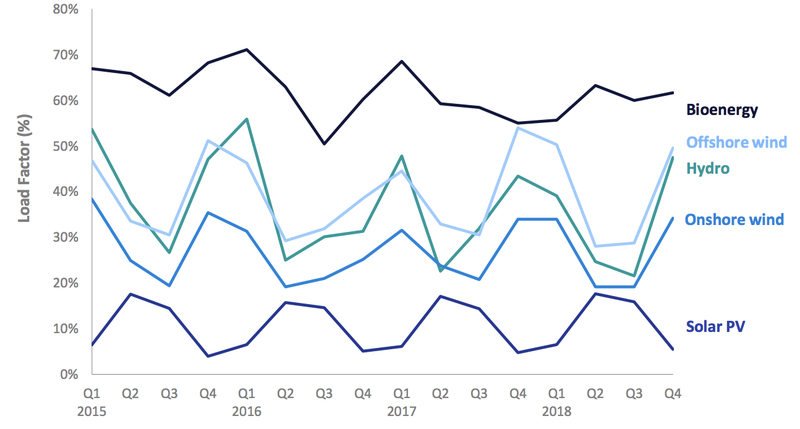 Average load factors for onshore wind dropped 1.7 percentage points in 2018, falling to 26.4%. This was due to a decrease in wind speed, BEIS stated. 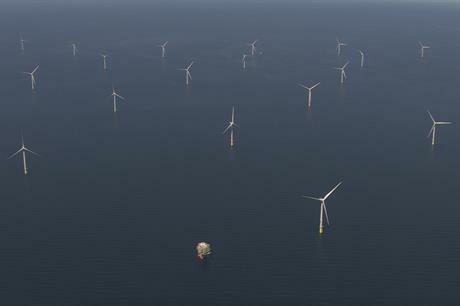 Meanwhile, average load factors for offshore wind increased by 1.2 percentage points to 40.1%. A blustery week in mid-March 2019 meant over a third of Great Britain's electricity was supplied by wind turbines, according to RenewableUK and Aurora Research. From 11-17 March, wind power generated 38% of Great Britain's electricity.